Budgeting for a vacation can be both exciting and stressful even if you know what you're doing. There are some choices that one must make to get the most out of even the smallest budgets so take a look and see what you can do to maximize your student travel budget for an affordable and fun trip. Hotels make up some of the hardest and most "unfriendly" issues that can wreck a budget before the vacation even begins. We would all love to spend a little more and stay in a five star luxury hotel on the waterfront but when you're on a budget, it's not always feasible. Instead, you might have to make some decisions to save money on your stay to spend it on touring, transportation, and food. The type of hotel depends on your group type. If you're chauffeuring a group of students, look to roadside hotels, chain hotels, and budget boutique hotels that are geared for budget stays. The farther you get outside of the city center, no matter what city, the hotels will be cheaper. If you're staying in the city with a couple of friends, don't rule out hostels or house-sharing programs like Airbnb, WWOOF, Homestay, or even Trusted Housesitters where you can watch a family's pets and stay in their house instead of a hotel. Again, this depends on your group. 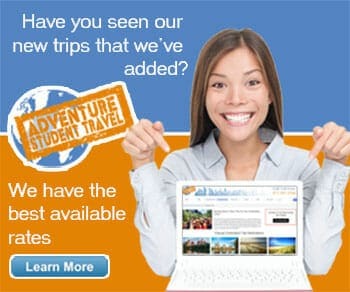 If you are a college student traveling with a few friends, then travel insurance is probably not necessary. On the other hand, if you're leading a group of younger individuals, if you're a teacher or parent supervising students, then travel insurance is always a good idea. Talk to your travel agent, if you decide to go through an agency, and they can give you advice on what to do. Like hotels, transportation can wreck a budget - but slyly. Budget rental car fees, plus gas and parking fees, add up very quickly plus driving in a new city can be a major headache. Unless you're traveling outside the city on a side trip, skip on car rentals. Instead, use public transportation. It's there for you to utilize so why not take advantage? Most if not all cities have routes directly to the major tourist stops and offer day passes for a cheap option to travel often and far. A third option, of course, is the cheapest of all: walking. If you have the option to walk to your destination, like you probably would in cities like New York, you can cut out that transportation fee altogether and save quite a bit of money. Something that not everyone thinks about when traveling is what to do about money: hard cash or credit cards. You could go both ways and many do just to be safe - don't keep all your eggs in one basket and all that. It's kind of common sense not to put all of your money in one spot just in case, God forbid, you lose your wallet or worse. However, when you're traveling, unfamiliar ATMs might have extra fees that can add up. Likewise, if you decide to use credit cards, either exclusively or in addition to cash, please consider identity theft protection so that you don't have an unwelcome surprise. Some travel friendly credit cards now have travel protection which allow you to shut off your credit card remotely via your online account without having to cancel the whole card which is something to think about. Sometimes you have to fly, especially if your destination is a whole country away from your homebase. Other times, it's a matter of budget and time. There are budget flights to smaller airports that if you decide to fly, you should look into. Bypass major international airports, unless they have crazy low rates, and look to regional ones that are looking to build up business with smaller airlines. If your home and destination are close enough together, think about trains. It may seem a little out of date but Amtrak is making a comeback with luxury rides (well, more luxurious than flying coach) and travel packages that can take you directly to your destination. You get amazing scenery for a discounted price - but it will take longer than flying. The same goes with buses only you don't get the "luxury" of the train. The final option, since boating isn't really feasible in the U.S., is roadtripping. Gather a bunch of friends and share the costs of the road. The more people you get to go with you, the cheaper it will be for everyone as you share gas prices, food, and parking. Plus, you get to see the lovely American countryside as you go and that's like an extra adventure. Generally I'd tell everyone to plan ahead. Mostly this is because of my personality but also because it's common sense. However, many people prefer to go a more spontaneous route and fly by the seat of their pants, wanting to figure it out once they get where they're going. Traveling this way does have its perks: You can act more like a local, find better deals (in some cases, not all) in person than you would online or over the phone, and you have different experiences than you would if you planned everything out in advance. This works for groups of young people and Millennial travelers but not generally for adults leading groups of youths. The best way to save money and be sure you're saving money is to write it all out. Write out all of your options and price each one. This takes time but that's what travel planning apps are for and we'll get to that in a minute. Plan on where you want to go, how long you want to be there, and what you want to see. Also, look into many options of the same thing such as types of hotels and how much you could save at each. Plan out an itinerary, or have a travel agent do it for you, to price exactly what you'd be paying per day and see what you can cut out. I always find it helps to look at the budget instead of just having a rough estimate in my head. You can catch more mistakes that way and it's easier to stay on track. This has to do with every other issue on this list. Deciding which season to go is almost as important as deciding where to go in terms of budget spending and saving. It's a trade off in most cases. Off seasons have fewer crowds, lower prices, but often worse weather. Shoulder seasons are another option, and fall between the off and on tourist seasons. These have slightly more crowds than off and slightly higher prices. For example, Washington, D.C.'s high season is March to mid-June and mid-September to November, when the physical seasons are changing and the swampy city isn't as muggy and the weather is more pleasant. The low season corresponds to high heat, namely July through mid-September, and the bitter cold in January to February. It is significantly cheaper to travel in the off season but you might have to brave the bitter cold and high heat to stand it.